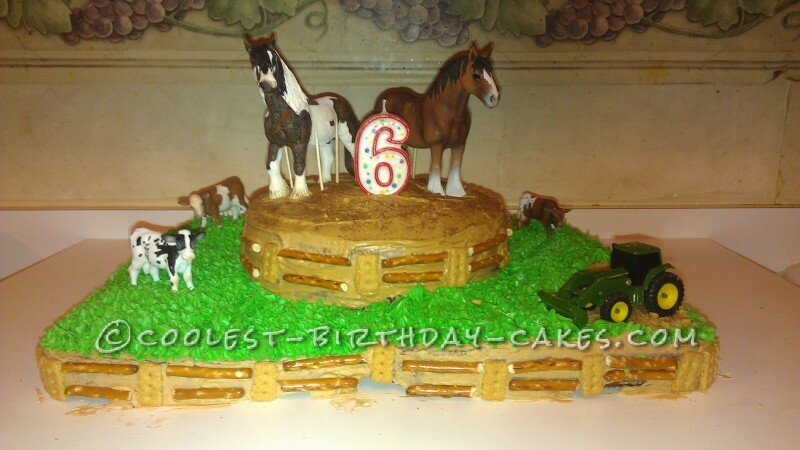 I make this Gitty-Up cowboy cake for my son’s 6th birthday. For weeks my son asked for a Soccer birthday party so I was dead set on making a soccer cake for him, BUT at the last minute he decided he wanted a cowboy birthday party. With only 2 days to change EVERYTHING from soccer to cowboy (which was not as easy as you would think), I had to re-plan the whole cake design and quick. 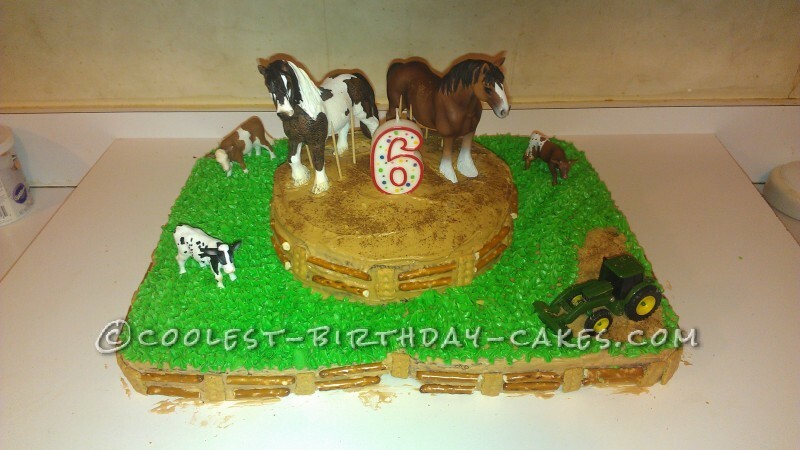 My son wanted everything cowboy related on his cake (cows, horses, big green tractor, and of course a cowboy). I drove to every store with in 50 miles and could not find anything but a few little cows, a small tractor, and a few horses, NO COWBOY. My mom looked where she lives and she could not find a cowboy either! So with what little time I had I made him a Gitty-Up Cowboy Cake. 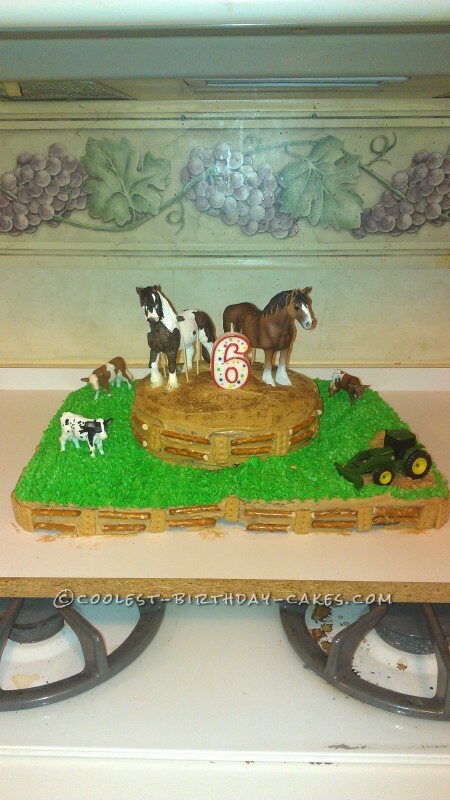 I told my son that I was sorry I could not find the perfect cowboy for his cake because the cowboy was to big to fit on his cake. When he asked well where is he? I told him HE WAS THE COWBOY, which made him happy. The party was a huge hit and now every one is asking me to make cakes for their kids, lol. To make my cake I used 2, 13×9 cakes (side by side) and iced them with Wilton frosting colored with Wilton brown cake dye. Then I used 2 round 9×9 to make the center cake and iced it as well with the brown colored Wilton frosting. Next I colored Wilton’s frosting green (Wilton’s cake dye) to make the grass. For the coral fencing I used small Gram crackers and pretzel sticks (I cut the sticks in half).Finally I placed all the figurines in place which I bought at Tractor Supply. Just a tip: when using Wilton’s frosting you may want to add a few drops of water to the frosting as sometimes it has a tendency to be really thick. I hope you enjoy this cake idea as much as we did!